Though late in the series, this book jumps back in time and takes place during the rein of the four Pevensie children. Lewis begins his story far south of Narnia, in the savage land of Calormen where a young orphan boy (Shasta) who is about to be sold into slavery meets a talking horse (Bree) and together they decide to make an escape to freedom in Narnia via its friendly neighbor, Archenland. They meet up with a young Calormene girl (Aravis), who is fleeing a forced marriage, and her talking horse (Hwin). During the course of their escape, they mix in with the Narnian court’s unpleasant visit to Calormen and discover a Calormene plot to overthrow Archenland. These elements give the plot a boost, but it’s the mix of characters that makes this one fun. Shasta is actually a white-skinned child, which marks him as a northerner and not a Calormene native at all. But Shasta has grown up poor and ignorant and does not realize this. Bree, however, a noble war horse who’d been kidnapped out of the north as a foal and seen much of the southern world, does know it. Where Shasta is quiet, meek, and unassuming, Bree is an excellent leader. Their escape across the dessert is successful in large part because of his strength and courage. He does tend to be prideful, however. So does Aravis, who is giving up a good deal of wealth. It’s particularly tough on her when she has to sneak through the great city of Tashbaan, knowing full well she should be carried in on the backs of slaves. Hwin, the mare, is also quiet and meek, but wise. 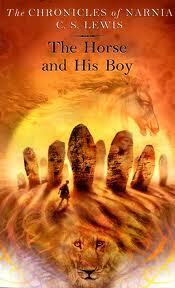 The Horse and His Boy is another fabulous adventure with strong undertones of faith and love. It’s one of my favorites. I highly, highly recommend the entire series. Previous One Space or Two? It’s worth reading again and again, isn’t it, Jenn? I vaguely remember the book. I read the series in 2000. But, if I remember, it is the third book in the series. If I read the series again, I’m sure some of it will come back. I loved the series. Good review. 2000! It’s time to read it again! If only there was more time in the day, right? Hard enough to get through everything once. By the way, I love the new cover on “Song of the Mountain.” I keep forgetting to tell you! Wow- I was surprised that there was a sequel, but I didn’t realize there will be a third book! Yeah! Your cover is excellent. There wasn’t going to be a sequel. Then I reread Song over the summer and realized how many questions were left unanswered and how much history was left unwritten. There’s plenty of material for two more, though I’m a little curious myself where the story will take me. Thanks, Erik. Yeah, that poem is pretty cool. A unique way of looking at life.